We provide both the necessary transportation equipment and the services skill set to meet a wide range of shipping needs. Our excellent trucking services coordinate seemlessly to provide true multimodal transportation. We provide truck transportation sufficient to meet all special and exceptional needs. We can handle lengthy cargo, as well as manufacturing machinery where temperature and vibration control require careful consideration. 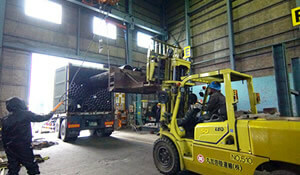 Our employees are experienced in loading and binding, so we can handle heavy cargo and delicate machinery properly. 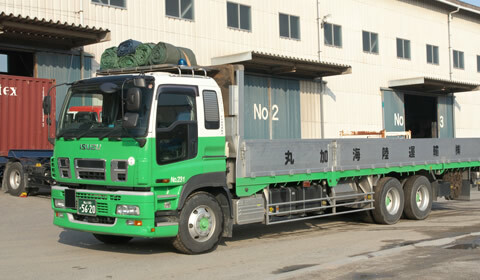 For small and medium sized loads, we can manage JIT transportation. We can also analyze your production and distribution arrangements and suggest appropriate transportation solutions. Our employees manage transportation with a high degree of professionalism. Our transportation services are secure, accurate and efficient. We also provide cargo liability insurance. We have 30 years of experience hauling lengthy cargo. 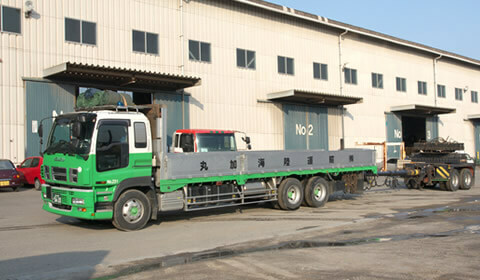 Lengthy, undividable cargo can be transported via pole trailers. You can choose either turn-table-fulcrum or table type, whichever is most suitable for your cargo. We have a qualified certification approved by the government and also arrange for lead cars when we transport lengthy cargo. Above all, we emphasize safety. Sling work using cranes and storage differs depending on the type of cargo and according to the center of gravity for each type of cargo, especially shipbuilding materials, steel materials, machine tools and manufacturing equipments. We posses an 11,559 ㎡　bonded storage warehouse, are able to manage time-sensitive preservation needs for import and export cargo, and epedite customs procedures. 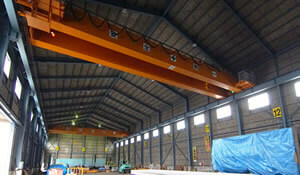 In 2011, we incorporated a 25 ton overhead crane into our storage facility. .Between them, your cargo can be handled efficiently by the simultaneous operation of our 15 ton and our 25 ton overhead cranes. At the port of Fukuyama, we regularly engage in custom clearance work for ships from East Asia (China, Korea) and South Asia. Our registered custom specialists can complete the import and export requirements for complex customs clearances. We also posses bonded storage facilities and manage a wide range of issues for bonded transportation, as well as container transportation and general transportation. We support all the procedures of transportation from importing to exporting, storing to transporting. We provide trade consulting services. Please feel free to contact us about any issues regarding international trade such as restrictions for each country, points of attentions of each item, and procedures for import and export. We provide mobile cranes for use in every field such as construction and civil engineering work. 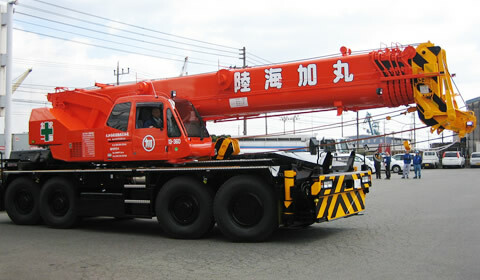 Cranes suitable for rough terrain are also available, from small to 65 T.
Our crane operators are highly experienced. Our staff also have skills in welding and slinging, as well as in the installation of machines. We also transport hazardous materials safely and accurately, using our own vehicles, and maintain records of delivery destinations, facilities, and receipts. Our transport services are reliable and highly valued. 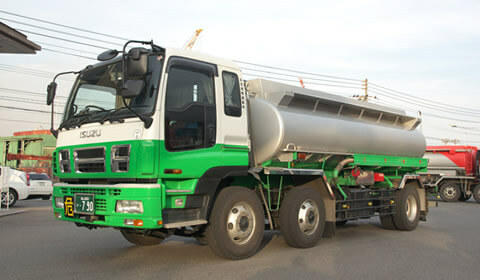 We transport gasoline and distilled oil, LPG and chemical products. * We maintain records of delivery destinations. We provide safe hazardous material transportation according to all applicable guidelines and safety regulations. We have 30 years of experience. We also take out liability insuarance that can cover accidental mixture of oil.